Living Dead Dolls Resurrection Second Coming Series 2 at WackyStacker.com of Horror & Laughs! laid to rest.......... Living Dead Dolls Resurrection Series 2 celebrates the second coming of the most popular characters with new twisted designs from their creators. The phenomenon that has become "Living Dead Dolls" strikes again with these "laid to rest" characters from the 10" doll line. The resurrection of Sadie, Lou Sapphire, Lilith, and Lulu. Featuring macabre new accessories and darkly deviant designs, these lethally deviated dolls are sure to raise some hell. 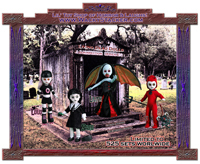 Living Dead Dolls Resurrection: The Second Coming is a limited edition of 525 sets worldwide. All four dolls have new glass-like eyes that will burn into your soul. All dolls include their trademark death certificates, intricately detailed outfits and are hand painted. MANY OF YOU ARE ALREADY AWARE. YOU KNOW EXACTLY WHAT YOU'RE BUYING. "Lou w/ Coffin Pitchfork & Witch Mask"
"Lulu w/ Coffin Roller Skates & Helmet"